“To play baseball for St. Louis,” deadpanned the archbishop. Although the joke has probably been around before Archbishop Fulton J. Sheen was in short pants, it was the first time the students heard it. And you can’t really blame the St. Louis-born-and-bred archbishop for having a bit of fun. 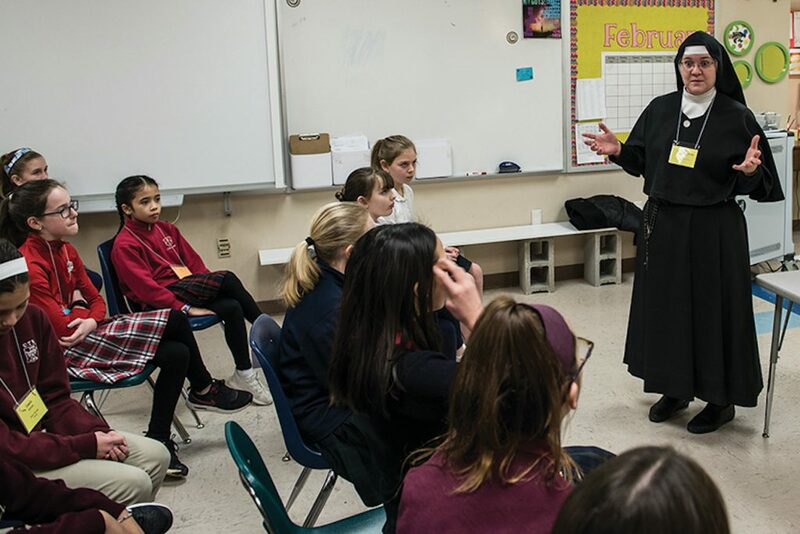 Of course, Archbishop Naumann quickly moved on to a different answer to this question, as well as a few others during the annual Fifth- Grade Vocations Day held on March 5 at Ascension Parish in Overland Park. More than 770 students from 23 schools in Wyandotte, Johnson and Miami counties, as well as their teachers, participated in the event. It was sponsored by the archdiocesan vocations office, with assistance from the Serra clubs of Johnson and Wyandotte counties. The day began with a video presentation and short talk by Father Dan Morris, director of the vocations office, and a brief time for eucharistic adoration. The remainder of the day was spent with the students going from classroom to classroom to listen to vocations talks given by six religious Sisters from four different orders, nine archdiocesan priests and two young adults discerning possible vocations to the priesthood or religious life. The talks were followed by Q&A periods. Sister Catherine Bussen told a group of young girls how she became a member of the Sisters, Servants of Mary Ministers of the Sick. She joined the nursing order even though she had never wanted to be a nurse. She has never regretted becoming a religious Sister. Father Matthew Nagle, associate pastor of St. Michael the Archangel Parish in Leawood, teamed up with seminarian Keith Chadwick to talk to the boys. “No question is off-limits,” said Father Nagle. “Do you have to wear black shoes every time you go out?” asked one boy. “There’s no rule about the kind of shoes you wear, but it would look kind of goofy if I wore my basketball shoes,” said Father Nagle. One boy asked if priests have a special diet. The hardest thing, sometimes, said Father Nagle, is that you’re always a priest and, therefore, a public person. Often, people will know you, but you don’t know them. Even so, Father Nagle loves the priesthood. “I wouldn’t want to trade being a priest for anything,” he said. Monsignor Michael Mullen, senior associate pastor at St. Joseph Parish in Shawnee, impressed a group of boys by his years of priestly service. “How long do you think I’ve been a priest?” asked Msgr. Mullen. “100 years!” yelled one boy. The ever-youthful monsignor explained he’s been a priest for “only” 57 years — and hoped to serve longer. The students closed out the day by attending a Mass celebrated by Archbishop Naumann. The next Fifth-Grade Vocations Day will be held on Oct. 2 at Most Pure Heart of Mary Parish in Topeka.